On clear days, looking west from the summit of my backyard cliffs, I can just make out what looks like a giant haystack on the horizon. If I were to hike due west from my house, across the Rio Grande Valley, over the Jemez Mountains and into the Rio Puerco Valley, in about 100 miles, I would find myself at the foot of this massive mound of rock. Horse on the road to Cabezon. Take 550 to 279 West. Driving this road is risky after rain or snow. 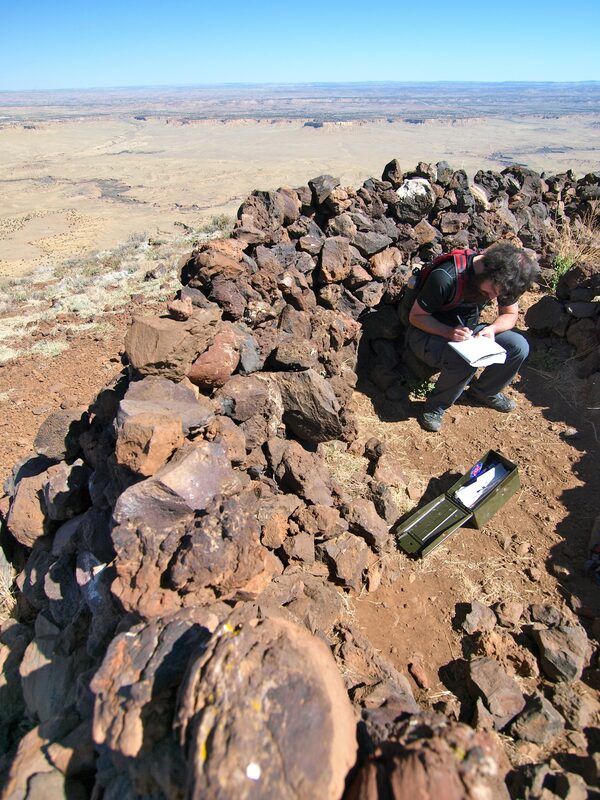 Cabezon Peak is an eroded volcanic neck, all that remains of a now extinct volcano. Millions of years ago, hot molten basalt shot up through the central pipe of this volcano, but instead of erupting, it solidified inside the mountain. Over millions of years, erosion removed the surrounding layers of rock, leaving behind a vertical spire of columnar basalt. 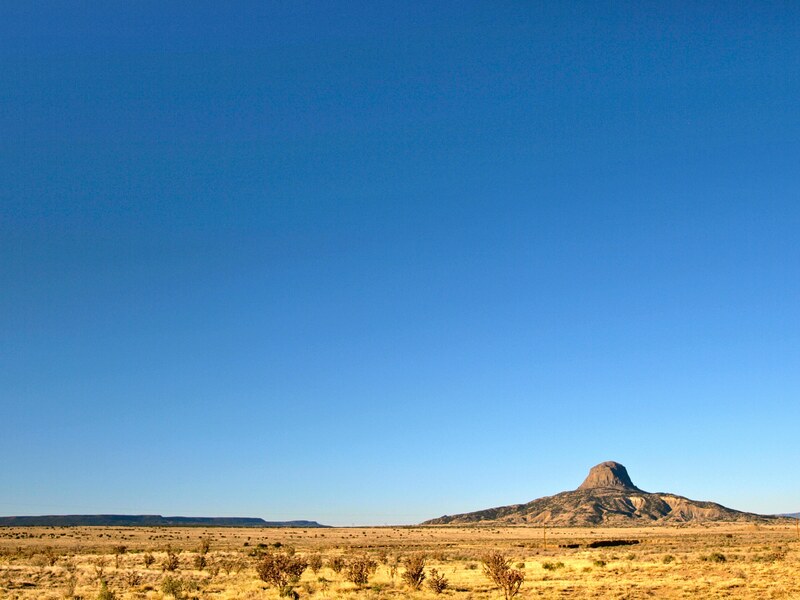 Shiprock in northwest New Mexico and Devil’s Tower in Wyoming are both famous examples of volcanic necks. 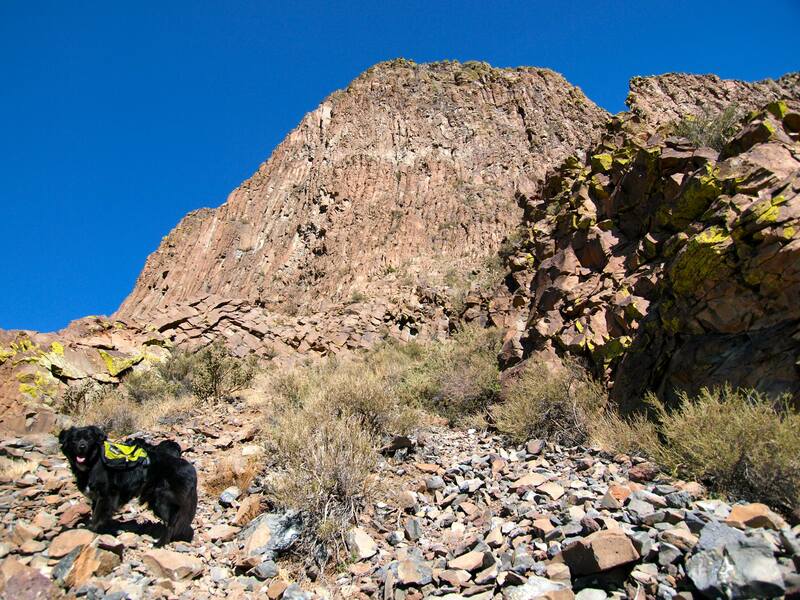 Rising more than 2,000 vertical feet from the surrounding landscape, Cabezon is the largest of more than 50 volcanic necks in the Rio Puerco Valley, a region known as the Mount Taylor volcanic complex. Cabezon means “big head” in Spanish. 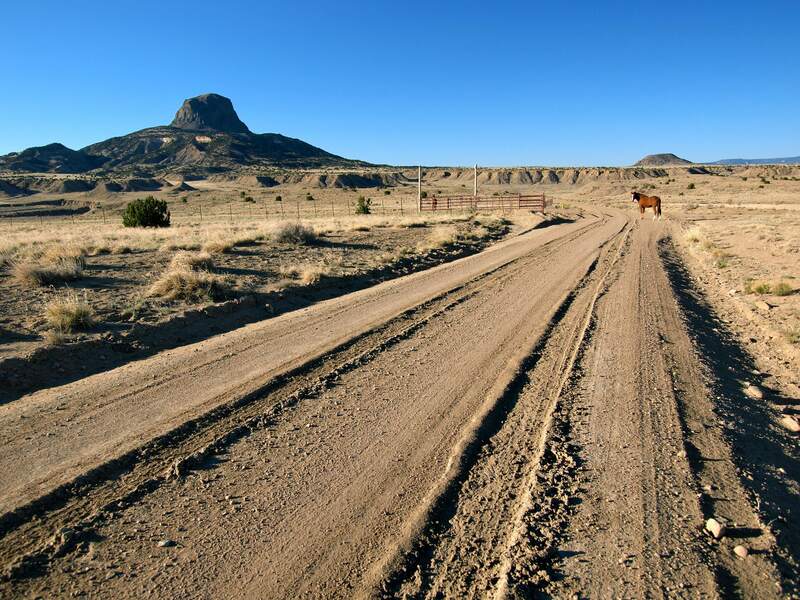 The name is believed to be derived from Navajo legends about a giant slain on nearby Mount Taylor, whose head rolled down into the Rio Puerco Valley and became Cabezon Peak. 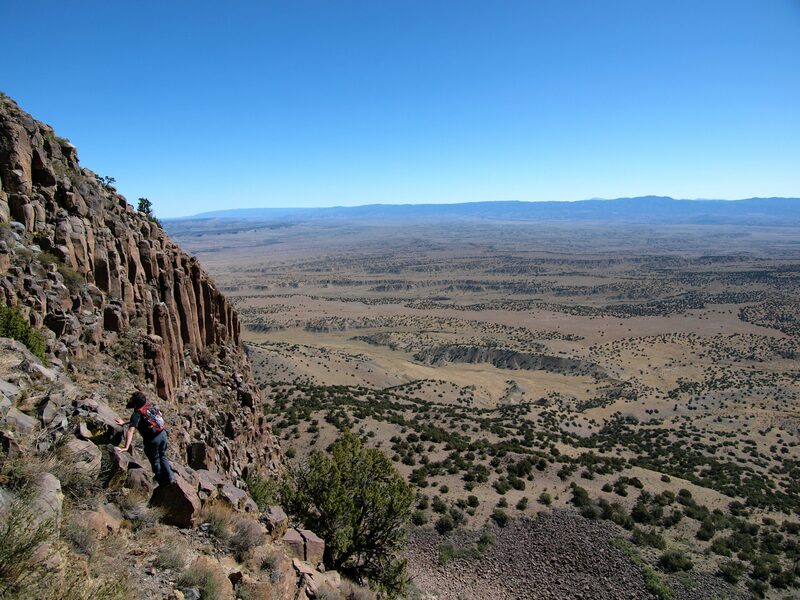 The closer you get to Cabezon, the more impenetrable it looks: sheer walls of vertical basalt columns are surrounded by an exhaustingly steep talus slope. But there is a chimney to the top: a scalable passage hidden somewhere in the rock face. Several years ago I tried and failed to find the path. 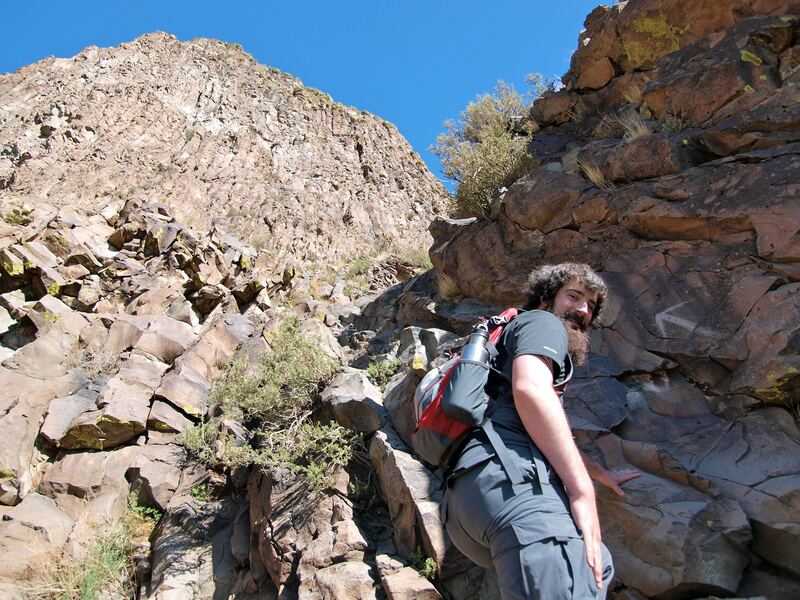 I was hiking solo that day and every route I spied looked far too dangerous to attempt without a spotter. 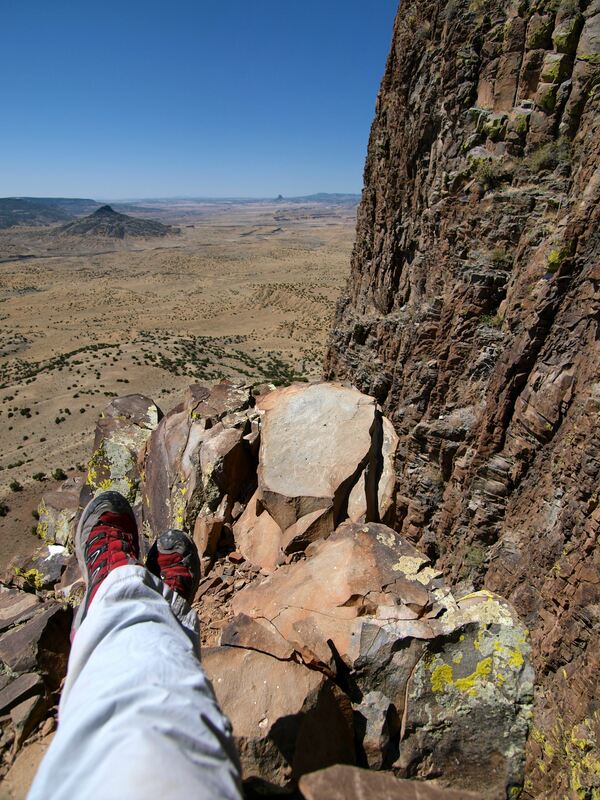 So I went home, did some more route research, and recruited a fellow climber to make another attempt on Cabezon. This time we made it all the way up! Class 1: Walking with a low chance of injury. Class 2: Simple scrambling, with the possibility of occasional use of the hands. Little potential danger is encountered. Class 3: Scrambling with increased exposure. A rope can be carried but is usually not required. Falls are not always fatal. Class 5: Technical free climbing involving rope, belaying, and other protection hardware for safety. Un-roped falls can result in severe injury or death. Drew and I did not use a rope or harnesses and the dogs made it about 3/4 of the way up before they were stopped by the first Class 4 section, towards the top of the chimney. My dogs are experienced rock climbers and I let them decide what they’re comfortable doing. I left them water at the base of that tricky section and told them I’d be right back. They stayed there like good, loyal dogs, until we got back down. Never, ever, ever tie your dog up in coyote country! The grassy summit of Cabezon Peak- 7,786 feet! Signing the summit register. Several weeks had passed since the last entry. Click here for more pictures of our climb up Cabezon and visit Summitpost.org for detailed route instructions. It’s a beautiful day here in New Mexico and I’m off for another hike! 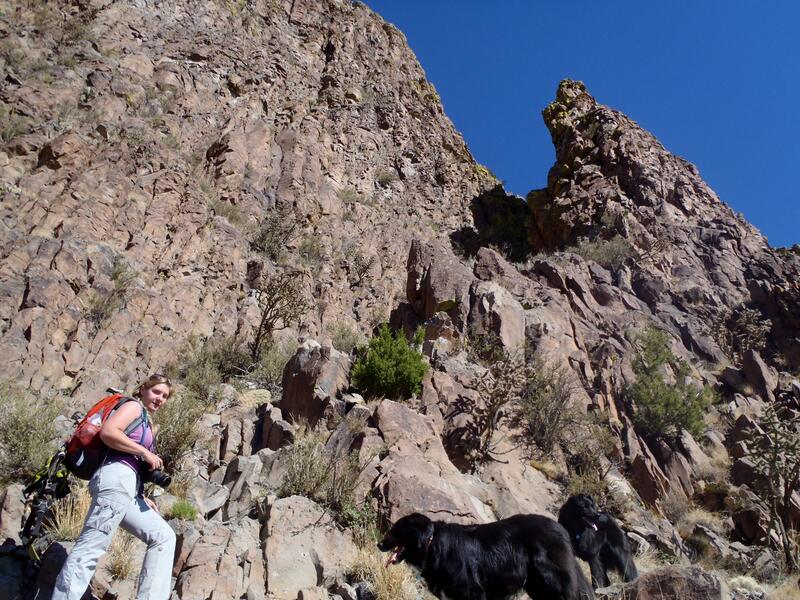 This entry was posted in Bowie & D.O.G., Hiking!, New Mexico, Photography, Road tripping! and tagged Cabezon Peak, dogs. Bookmark the permalink. We drove out there once. My husband was looking for an off-highway route to Cuba (whole ‘nother story) and kept insisting there were cities out there. Confused Californian, we don’t actually have cities anywhere in NM, except Albuquerque. Anyway we drove out to Cabezon then turned back to the highway.